Patricia Lee "Patti" Smith (born December 30, 1946) is an American singer, poet and visual artist who was a highly influential component of the New York punk rock movement with her 1975 d?but album Horses. Called the "Godmother of Punk", she integrated the beat poetry performance style with three-chord rock. Smith's most widely known song is Because The Night, which was co-written with Bruce Springsteen and reached number 13 on the Billboard Hot 100 chart in 1978. In 2007, she was inducted into the Rock and Roll Hall of Fame. In 1967 she left Glassboro State Teachers College (now Rowan University) and moved to New York City. She met photographer Robert Mapplethorpe there while working at a book store with friend, poet Janet Hamill. Mapplethorpe's photographs of her became the covers for the Patti Smith Group LPs, and they remained friends until Mapplethorpe's death in 1989. In 1969 she went to Paris with her sister and started busking and doing performance art. When Smith returned to New York City, she lived in the Hotel Chelsea with Mapplethorpe. The two frequented the fashionable Max's Kansas City and CBGB nightclubs. The same year Smith appeared with Wayne County in Jackie Curtis's play "Femme Fatale". As a member of the St. Mark's Poetry Project, she spent the early '70s painting, writing, and performing. In 1971 she performed ? for one night only ? in Sam Shepard's "Cowboy Mouth". (The published play's notes call for "a man who looks like a coyote and a woman who looks like a crow".) She collaborated with Allen Lanier of Blue &Ouml;yster Cult, who recorded several of the songs to which Smith had contributed, including Debbie Denise (after her poem "In Remembrance of Debbie Denise"), Career of Evil, Fire of Unknown Origin, The Revenge Of Vera Gemini, and Shooting Shark. During these years, Smith also wrote rock journalism, some of which was published in Creem magazine. 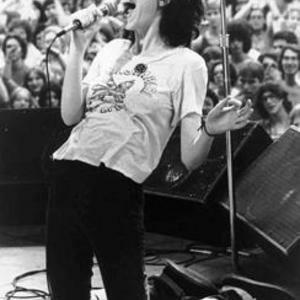 By 1974 Patti Smith was performing rock music herself, initially with guitarist and rock archivist Lenny Kaye, and later with a full band comprising Kaye, Ivan Kral on bass, Jay Dee Daugherty on drums and Richard Sohl, on piano. Financed by Robert Mapplethorpe, the band recorded a first single, "Hey Joe/Piss Factory", in 1974. The A-side was a version of the rock standard with the addition of a spoken word piece about fugitive heiress Patty Hearst ("Patty Hearst, you're standing there in front of the Symbionese Liberation Army flag with your legs spread, I was wondering were you gettin' it every night from a black revolutionary man and his women..."). The B-side describes the helpless anger Smith had felt while working on a factory assembly line and the salvation she discovered in the form of a shoplifted book, the 19th century French poet Arthur Rimbaud's Illuminations. In 1996, Smith worked with her long-time colleagues to record the haunting Gone Again, featuring About A Boy, a tribute to Kurt Cobain. Smith was a fan of Cobain, but was more angered than saddened by his suicide. That same year she collaborated with Stipe on E-Bow The Letter, a song on R.E.M. 's New Adventures in Hi-Fi, which she has also performed live with the band. After release of "Gone Again", Patti Smith has recorded two new albums: Peace and Noise in 1997 (with the single 1959, about the invasion of Tibet) and Gung Ho in 2000 (with songs about Ho Chi Minh and Smith's late father). A box set of her work up to that time, "The Patti Smith Masters", came out in 1996, and 2002 saw the release of "Land (1975?2002)", a two-CD compilation that includes a memorable cover of Prince's When Doves Cry. Smith's solo art exhibition, "Strange Messenger" was hosted at The Andy Warhol Museum in Pittsburgh on September 28, 2002. On April 27, 2004 Patti Smith released Trampin' which included several songs about motherhood, partly in tribute to Smith's mother who died two years before. Smith curated the Meltdown festival in London on June 25, 2005, the penultimate event being the first live performance of "Horses" in its entirety. Guitarist Tom Verlaine took Oliver Ray's place. This live performance was released later in the year as "Horses/Horses". In August 2005 Smith gave a literary lecture about the poems of Arthur Rimbaud and William Blake. On July 10, 2005, Smith was named a Commander of the Ordre des Arts et des Lettres by the French Ministry of Culture. In addition to her influence on rock music, Minister also noted Smith's appreciation of Arthur Rimbaud. On October 15, 2006, Patti Smith performed at CBGB nightclub, with a 3?-hour tour de force to close out Manhattan's music venue. She took the stage at 9:30 p.m. (EDT) and closed for the night (and forever for the venue) at a few minutes after 1:00 a.m., performing her song Elegie, and finally reading a list of punk rock musicians and advocates who had died in the previous years.